Garena Universal MapHack 13 - GUMH 13 for Warcraft 1.26a Patch - This is the updated version of GUMH to support the new Warcraft III blizzard patch v1.26a (1.26.0). The GUMH v13 supports Warcraft 3 1.26a patch. What is new with Garena Universal MapHack Version 13? 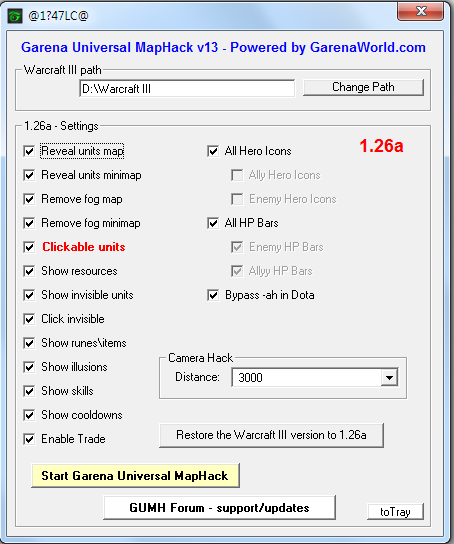 How to install Garena Universal Maphack 13 - GUMH 13 for Warcraft 1.26a? First you must download "Garena Universal Maphack 13 for Warcraft 1.26a". Where to Download Garena Universal MapHack 13 - GUMH 13?